This post is in response to Mike’s query on the chatbox. mike: do you have a formation for barcelona?im a huge fan of the team and my friend plays 4231 with torres as lone striker is dat a good formation for pool? This is a great question as I have much to say in response to this. Thanks Mike! Barcelona is a fantastic team, not just in the game, but in real life as well. In PES 2010, the formation and line-up is good on its own already. In the match, make use of Henry on the left to dribble, cut in around the penalty box for a shot on goal. Just like in real life, Henry can score from his right foot from the tightest of angle in the game. Do the same for Messi on the right flank as well, as Messi is able to execute the “Rabona Shot”. Dani Alves is a danger when going forward. Try a few long shots and early cross into the box. 4-2-3-1 is a decent tactic for Liverpool, making use of Gerrard and Torres up front, with Mascherano in midfield. This makes the midfield a little crowded. I would man mark Torres with a defender, and Gerrard with Yaya Toure, or any player whose position is close to Gerrard. Take note of the side backs, and focus your attack on the flank with the weaker sideback. 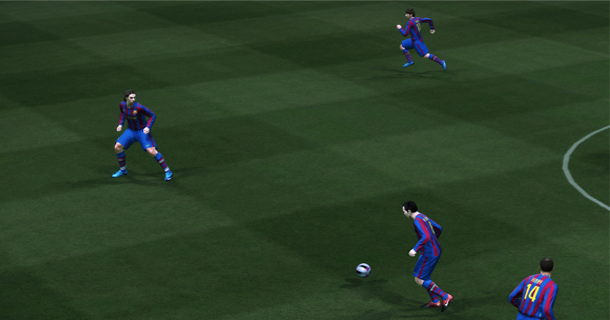 Unleash your Henry and Messi on the sidebacks, switching flanks, dribbling, pumping long balls, everything! Since Barcelona wingers are one of their strongest attacking players. When the going gets tough, use Xavi and Iniesta to pass through ball in the middle, or lofted through ball for your Center Forward, presumely Ibrahimovic. Their passing skills are excellent, thus their passes are hard to defend against, and Ibrahimovic is a skillful striker. But watch out when defender. Puyol is a fast defender, but he may lose out on high balls, so ensure he has a tall defensive partner. That would be what I have to share for the query. I have a fren though…who loves barcelona since he can wreck havoc with messi but i’ve managed to subdue him thanks to ur wonderful defending tactics..
What do you reckon, any other ways to beat barca??? Thanks for find my guide useful, really glad i could help you out. Yes i agree with you that Ibrahimovic is really hard to defend against. I feel that you will need a strong defender to man mark him. And try to cut down on the number of crosses going into the box, by getting infront of their wingers and blocking their crosses. Of course I know this is easier said than done. For me, to beat barcelona, i will recommend a very counter attacking play. Have 2 fast wingers to take advantage of the space left behind by their SBs, especially their RB Dani Alves. When playing Barcelona, do not attack with your SBs as you need them to stop Barcelona’s dangerous wingers. Man mark their CF and their AMF. Play at least 1 tall and strong DMF to win tackles. And once you have possession, try to quickly release the ball to your wingers to take the ball upfield for a counter attack.. I hope this brief tip gives you some inspiration Sandro! Depends on what your team. The Metzelder CB as more open shut Messi tano for crosses and kicks and can connect directly with the attack against Kaka. On the left side would care rises from Sergio Ramos that Henry would leave the free, this case does not come back with him but call or Gutti or Xabi alonso to mark it or Pepe (in this case leaving Ibra free, must to attack with or without fail). Ibra should already be aware that it shoots well from anywhere and have the pass very well need to know head better. To lock it with a ball on the foot must surround him with at least three, using pressure from the NCP (non players control). If it does not help against attack to sweep, he is good on bumper should pull someone to spare. Just stick with Just stick with FIFA. PES games may LOOK amazing, but the geapmlay is just horrible. Everything is just too fast and unrealistic. The players also look like robots when dribbling. If you want a game that actually FEELS like a real futbol match, then stick with FIFA.